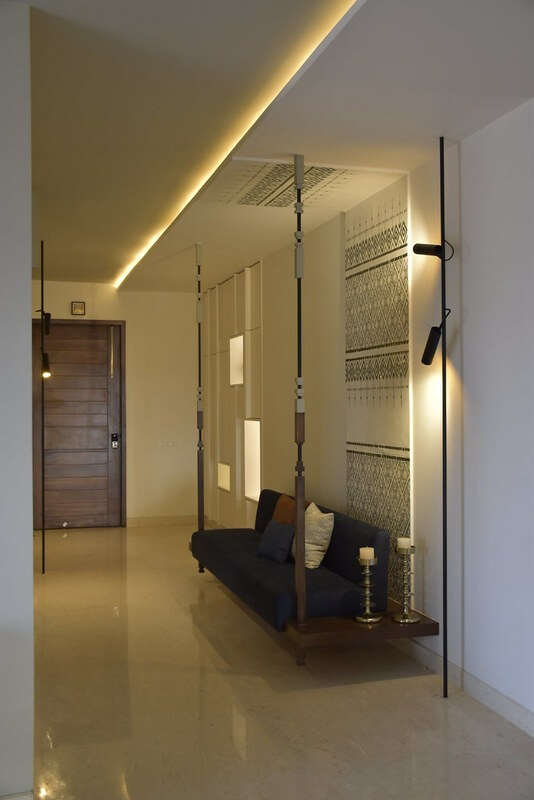 This post features a Bangalore apartment decorated using mirror art work called Thikri. Years ago, I had this beautiful yellow dress adorned with mirror work that my mom bought in Bangalore enroute our home town. Mirror art work on dresses was common place then. You know how it is — when ends meet means, when things one owned were far and few and only 2-3 occasions in a year were worthy of getting a new dress, each one was special and you remembered them for a lifetime. Now, umm. I wonder if we would remember what we bought last year for Diwali. This living room is a head turner and the reason for that trip down memory lane. When I learned that it was mirror work adorning the walls, nostalgia hit me and I was reminded of that dress from years ago. Embellishments in palaces is heard of , but in apartments? 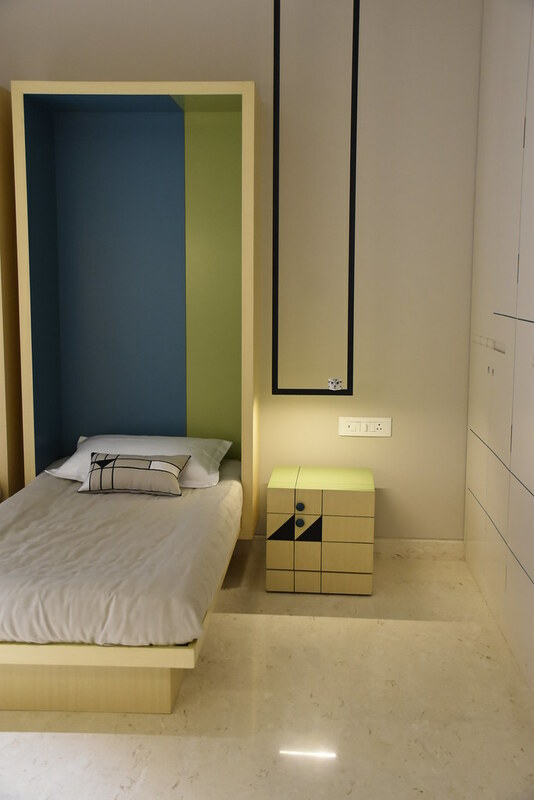 This 2,620 sq.ft, 4-bedroom apartment is designed by Land Studio for a family of three generations in Bangalore. Rajendra Pachisia and his wife Kiran live with their son, Rohit, daughter-in-law Kavita and grandchildren, Arnish and Drisana. Rajendra runs a business with son Rohit while Kavita is a kindergarten teacher. Who lives here: Rajendra Pachisia and his family. In short, three generations comprising 4 adults and 2 children. What was the brief given to you? 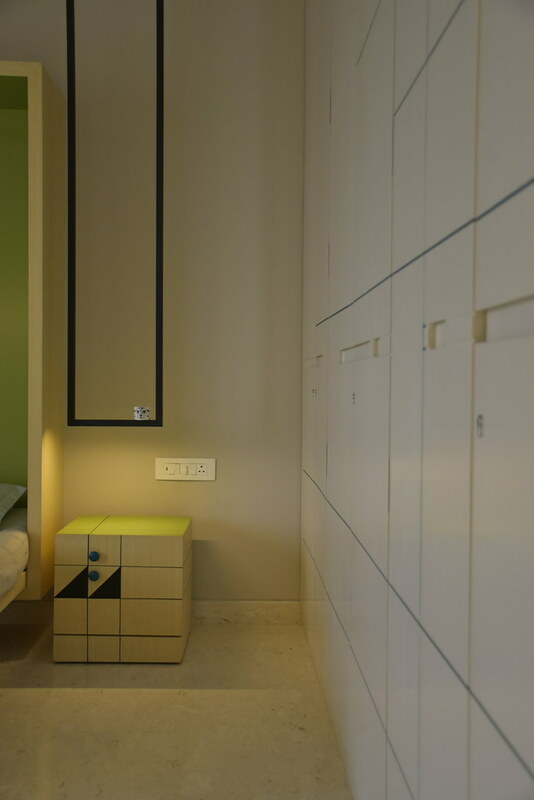 Kavita wanted a modern , clutter-free home with enough storage in each room. They wanted us to treat the house like a playground for the kids to run around and not have too many artifacts or design elements that would be an hindrance for this. As you enter the home, you are welcomed with a mixture of purity in white on the left with a dash of subtle grey walls on the right. 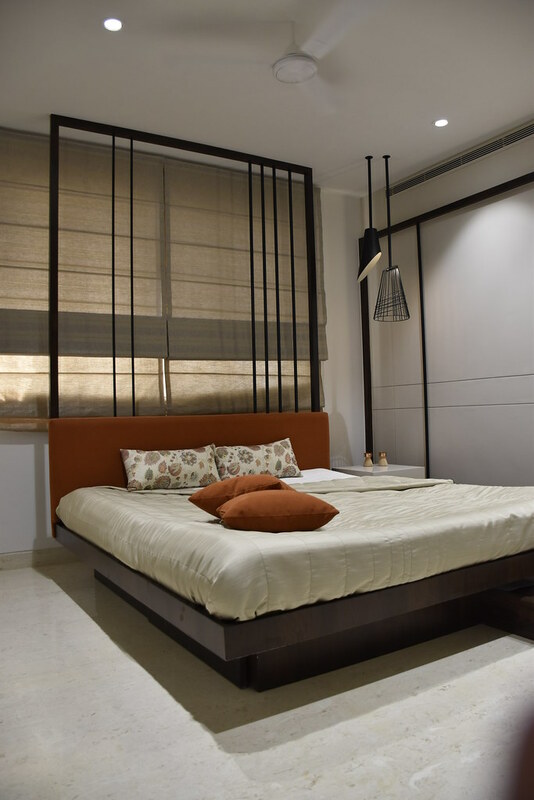 A fixed four poster seater is our interpretation of a jhoola or swing, a fixation that most of us have grown up with and aspire to have in our homes today. The ornamental jhoola stretches all the way into the ceiling. Your eye connects to the farther end of the living area, where a similar hanging seater occupies the width of the room. This seater acts as a vantage point for Kiran, from where she can see the kitchen, the entry and the kids all at the same time. 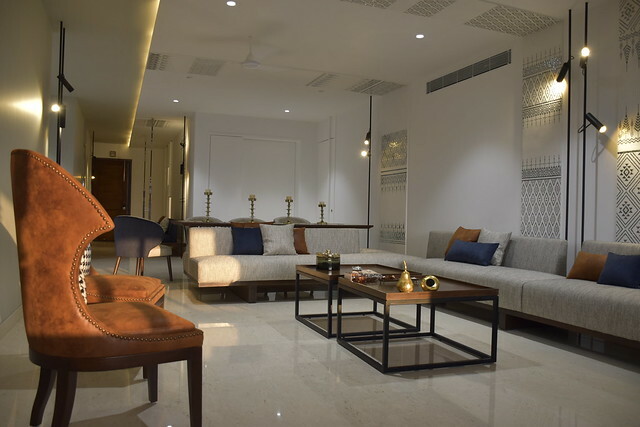 Design for us is a collaborative effort where ideas evolve and take shape between our design intent and the technical expertise of the skilled craftsmen.The walls and ceiling of the living area are adorned by the beautiful art of Thikri – a 16th century mirror art done on plaster of paris in the palaces in Rajasthan. 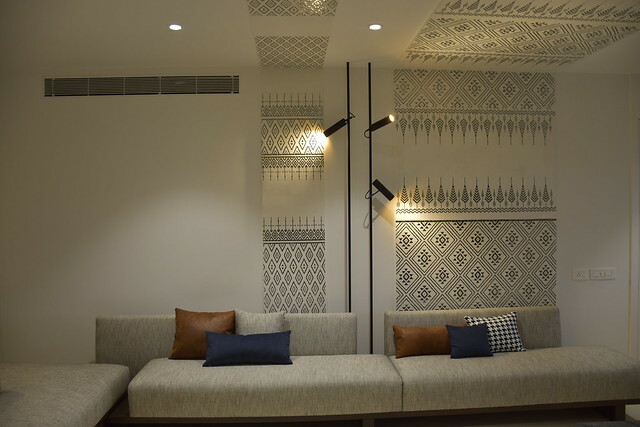 We collaborated with tradional Rajasthani artisans to create panels using the same art form on a tribal geometric design given by us that scale the walls and traverse onto the ceiling of the living area. The shimmer is priceless in the evenings. The custom made dining table has a wooden (teak veneer coated) top with clear glass support all held together by two wooden rafters rendering it afloat. 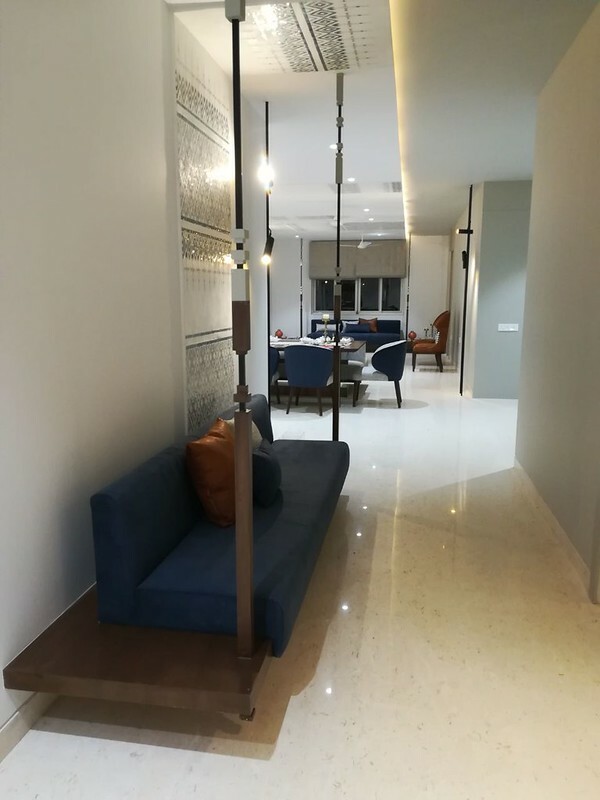 The back to back seater connects the dining and the formal living together. The palette of deep blue , tan and grey celebrates the pure white space . What is the inspiration behind this room as there hints of industrial design? 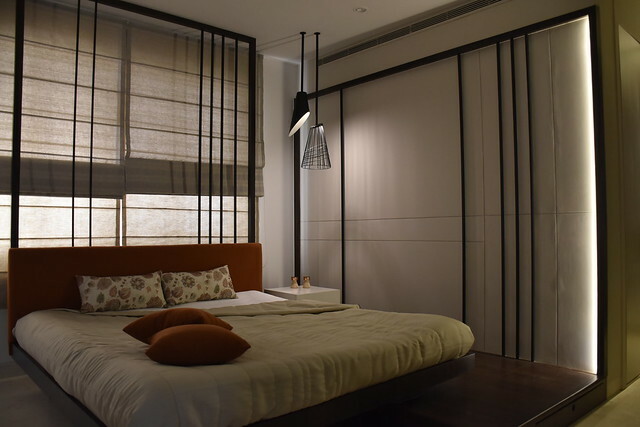 Rohit’s and Kavita’s bedroom is a blend of modernity with industrial elements thrown in good measure in the form of MS rods. The matt black finish gives it a warmth while the muted colors of the upholstery and wooden wardrobe bring an earthiness to the room. The lams are customized. Yes, you read it right. The conical lamps were a result of continuous trial and error with the fabricator to acheive the right proportion of opaque and wired piece to lend the clean lined space an organic element. 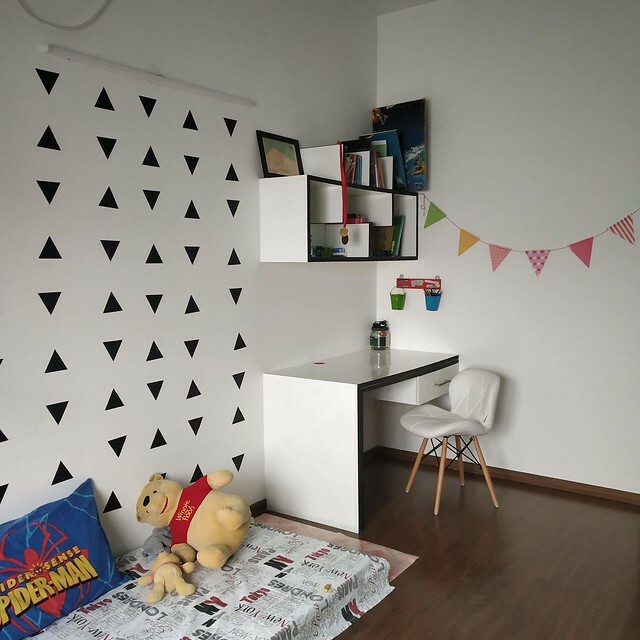 For the kid’s room We let their irresistible fun and energy inspire us . Using lines to play its part whether it be lighting , furniture, wardrobe , handles even soft furnishing.The hand painted cubes were the only accessories here executed by the home team that adorn the frames of light .The tone of blue and green for the headboard neutralized the light pine veneer in the room.The geometric artwork on the tables were customized with hand painted knobs. Arnish and Drisana earned the large balcony which flooded their mornings with light. 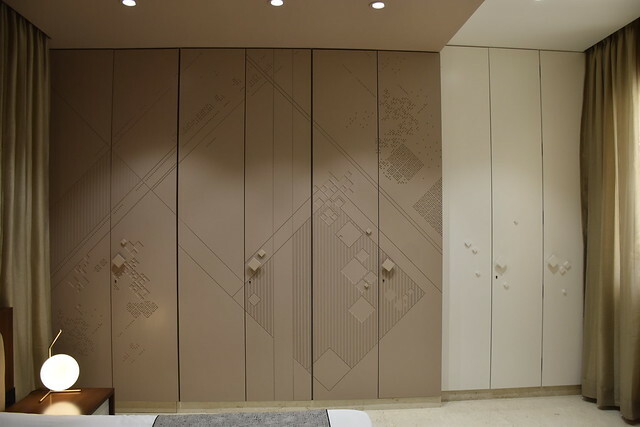 The patterns on the wardrobes in master bed room are interesting. Can you please elaborate? 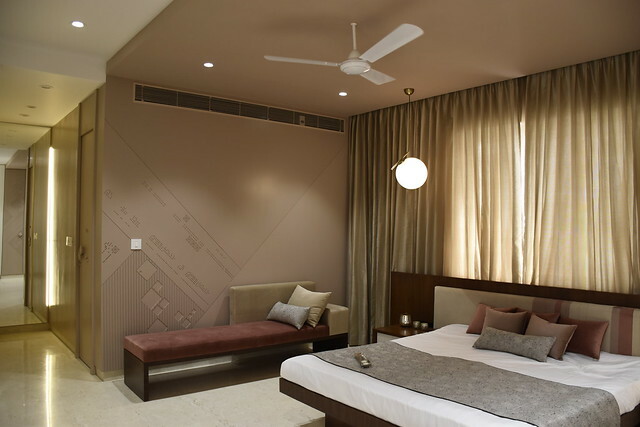 The master bedroom is dressed in subtle hues of dusty rose with patterns debossed in MDF. 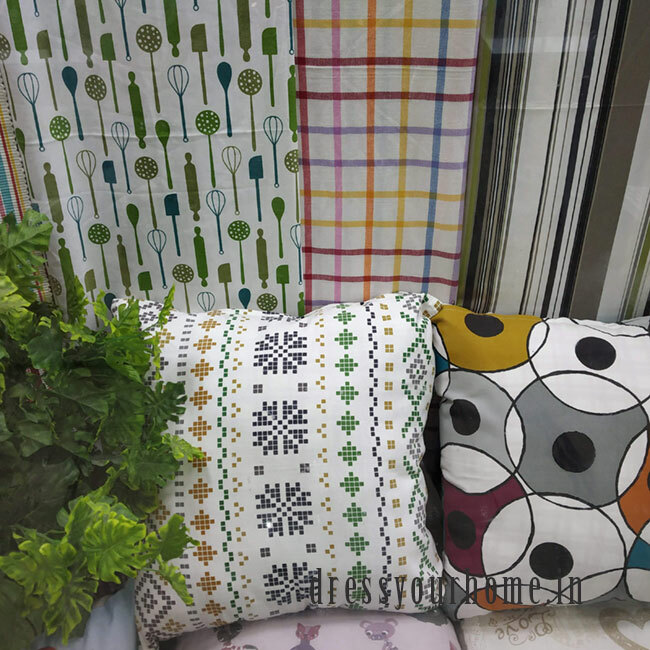 This pattern pattern was inspired by works of Patricia Urquiola. 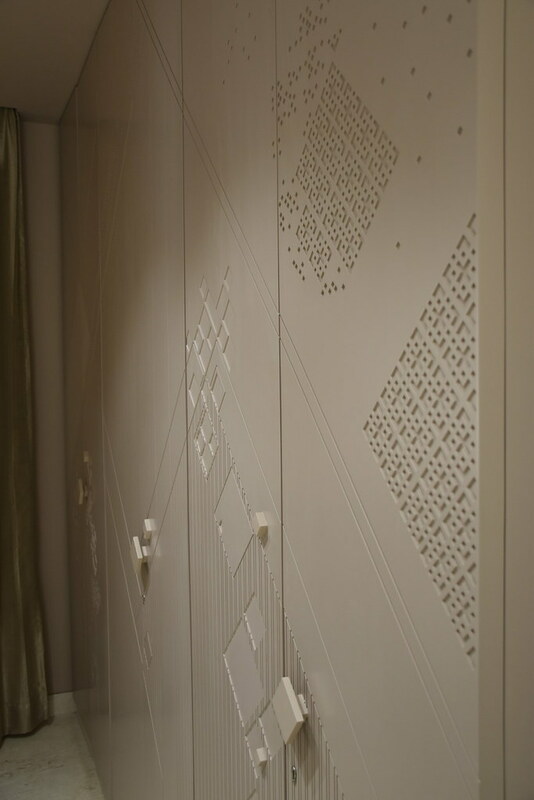 MDF, as a material, had limitations that we worked around to achieve the variations in depth, pattern and texture. Devil is in the details for us. If you look closely, you will notice that the handles beautifully blend in with the pattern. 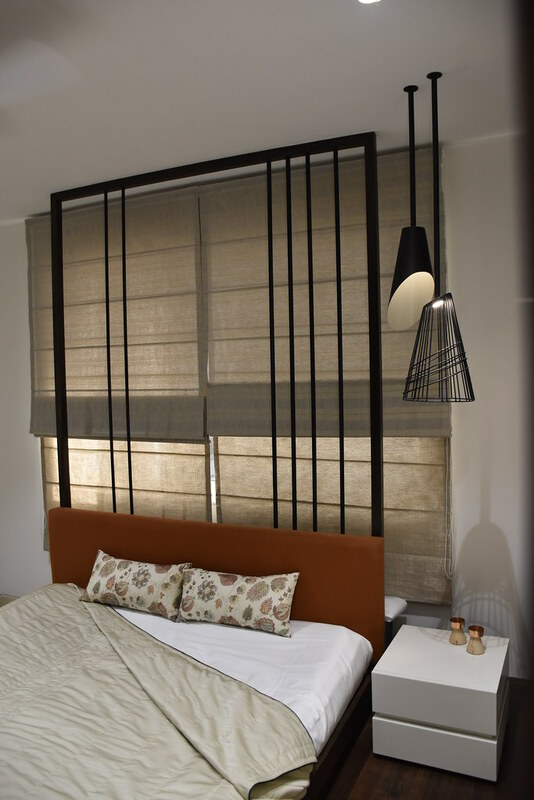 We added a quirk touch by making the lamps asymmetrical combining the variation of a table lamp and the hanging. The upholstered strips on the bed and sofa is an extension of the color tones. 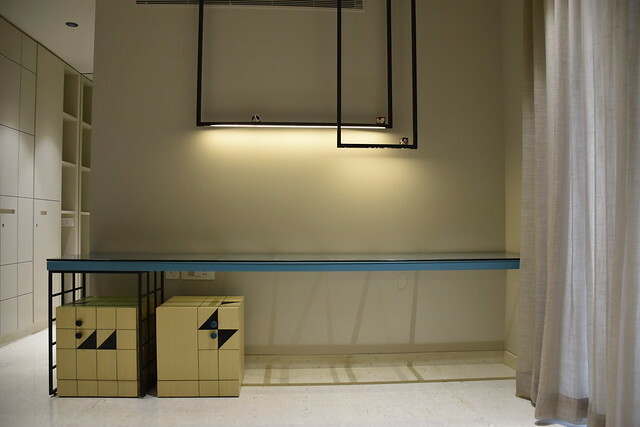 As for the guest room we played with dark and light cutting it with vertical strips of brass inlaid , tying up the space visually. 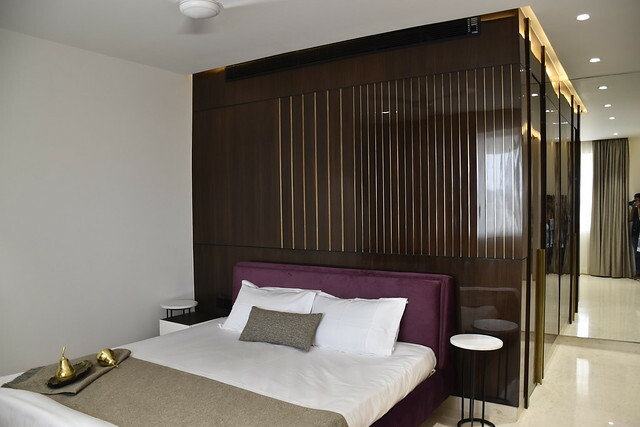 The aubergine toned upholstered bed with hydraulic storage sat well against the wooden(teak veneer) backdrop . The side tables here were made out of leftover stone. What kind of projects do you undertake and how can prospective clients get in touch with you? 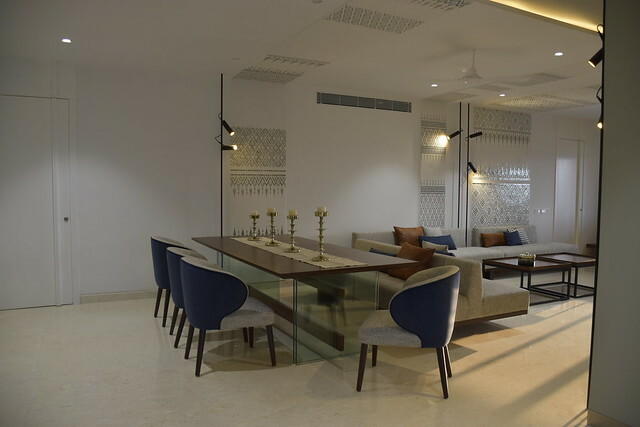 Land Studio is a Bangalore based team of architects, interior designers and product designers. We undertake projects that vary greatly in scale and typology, ranging from architectural, interior architecture and product design. We take on both commercial and residential projects.